This post is the final entry of a three part series, Modernizing Genre. I highly recommend you read parts one and two before continuing on to this piece. Part one, The Bane of Genre, criticizes existing videogame genres as constricting and inaccurate. Part Two, In Defense of Genre, supports the idea that genres are empowering and essential. This week I hope to pick up the scraps and invigorate genre anew. Genre, in all mediums, is not without its flaws. Convention is too easily relied upon, stifling creativity. This is readily apparent in videogames when browsing the shelves at your local purveyor, each cookie-cutter shooter nearly indistinguishable from the others. The unique characteristics of the games that do stand out make their assigned genres vague and/or inapplicable. Yet, abandoning genre altogether would be foolish. Genre can empower players and developers alike by providing them with the tools to create, understand, and explore videogame worlds that build upon themselves. A game that skirts, toys with, and reexamines genre can be a unique experience, pushing the medium to fascinating new places. What are we left with? How is genre to proceed if it's to survive at all? To salvage genre, we must change how we understand and label videogames. Last week, Scott posted a fantastic critical examination of Okami and its use, and misuse, of genre, calling Okami a "Zelda game." Accordingly, videogame genre should embrace content based classification over mechanic based classification to remain relevant. When I say content, I mostly refer to thematic and setting concerns. Science-Fiction, Fantasy, War, and Westerns all fall into this setting based taxonomy in both film and literature. Likewise, the sensations a work might try to elicit can describe a thematic based genre: Horror, Noir, and Comedy for example. While keeping in mind the differences between these genres, I agree with Thomas Apperly in stating "what is crucially important to video game genres is to be able to think of each individual game as belonging to several genres at once." Besides Horror, another content based genre seems to be garnering gamer support. Say hello to Zen Gaming, the category Sony has attached to Thatgamecompany's latest title, Flower. What could be more calming than controlling a soft breeze through a field, blooming flowers, and collecting petals along the way? The music enhances a game that is designed to both sooth and entertain challenge hungry gamers. It is easy enough for Zen Gaming to encompass other games as well. Flow, Thatgamecompany's previous release, could also fall into this category. The yoga exercises of Wii Fit could be Zen, along with PixelJunk Eden, Audiosurf, and the yet unreleased IGF entrant, Osmos. Most importantly, the Zen genre is descriptive not of a shared mechanic, but of a similar theme, which can be built upon, re-imagined, and enjoyed by players and developers. A player can reasonably assess the type of experience a Zen game might offer, but many content based genres are not as descriptive in this regard. Consumer-minded technical classifications may retain their usefulness when applied as sub-genres. Sub-genres can also be content based, as is necessary to truly appreciate individual games as potentially belonging to multiple genres, but existing videogame genres - FPS, RPG, etc. - should only exist as sub-genres. For example, Dead Space is first and foremost a Horror game. The futuristic setting and gravity altering mechanics places Science Fiction as its first sub-genre. Below this, Dead Space can be considered a shooter. These sub-genres need only be listed as necessary. 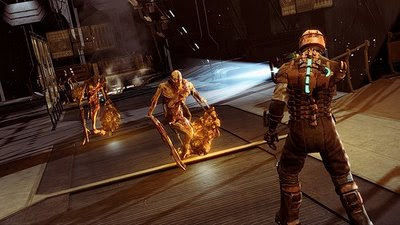 In our reclassification of Dead Space, a unnecessarily long header might read "a shooter SciFi-Horror." The key word, Horror, should be the focal point as it encompasses the mood, design goals, and player expectations all in one. Not all existing genres, be they content or mechanic based, should be applied to videogames. Action, Adventure, RPG, or Strategy are not descriptive enough to be genres or sub-genres and should be scrapped entirely. Meanwhile, some mechanic based categories should remain in common use, particularly for games without much narrative content. Though the term "Fighter" may be too broad (many games include fighting), titles in this genre have many similarities in content and play. The Puzzle genre can also be useful as the primary genre for games such as Tetris or Lumines, while also being sub-genre for narrative driven games like Braid or Portal. In these situations, content based classifications can be the sub-genre. Professor Layton, for example, is a Puzzle game first, a Mystery second. These ideas are still infantile and sketchy at best. The application of a revised genre taxonomy also requires very subjective analysis of a game's content, but that is exactly the outcome I desire. Genre frames how we talk about, understand, analyze, and enjoy videogames. We should treat genre with the reverence and critical eye the medium deserves, but modernizing genre is not easy. If you have thoughts on the subject, ideas for new genres, or old genres you'd like to see buried, please let me know. It is exactly the conversation we should have. I agree that "RPG" is a marginal term for describing games at this point. Really it just refers to certain game mechanics (inventory management and leveling?). This article at GameSetWatch talks about this a bit, sugesting that Fallout 3 is really just a short story collection. That said though, the term does bring something useful to the description of the game, in being a help to consumers who are looking for a certain type of gameplay experience. Used responsibly, the term "RPG" denotes that the games invests the player with responsibility for the well-being and the abilities of their player in a way that other games do not. Interestingly, although I am more willing to scrap "RPG" as a term, "JRPG" still strikes be as completely useful. Thanks for the comment. One of the reasons I want to scrap "RPG" is because its so heavily focused on user input. It is difficult to say how well a game encourages role-playing. User-developed content need not mean personal investment into a character. The player, theoretically, could take on the role of Master Chief more intimately than the player designed Fallout 3 character. But you are right, they are hard to identify meaningfully, and something like JRPG might actually be useful, but only because we don't have the right vocabulary to articulate the design choices and philosophies that differ across the pond. When a writer (or designer) signals that a work will don the chains of a genre, the work becomes associated not only with genre conventions but also with other works within the genre. Every move the work makes either in accord with genre or in defiance of that genre becomes an allusion, and thus a potential avenue for meaning. Genre is a wonderful tool. When used as a taxonomy, however, I agree that it can be a hindrance to creativity and innovation. That's an interesting point about sub-genres, as they would undercut the nebulous quality of a genre. I have always felt that genre is better visualized as a cloud, rather than a straight line.